The redbay laurels that once graced the coastal forests and residential landscapes of the Southeast have all but disappeared, taken down by laurel wilt, a deadly disease caused by a fungus (Raffaelea lauricola) carried in the jaws of the nonnative redbay ambrosia beetle (Xyleborus glabratus). Both beetle and fungus apparently arrived from Asia through the Port of Savannah, Georgia, sometime before 2002, when the first redbay ambrosia beetle was found in a monitoring trap near Port Wentworth, Georgia. Since that time, the disease has spread rapidly, killing almost all of the large redbays along the coasts of Georgia, South Carolina, and Florida. Recently the disease spread into the coastal plain of North Carolina, and has been found on redbay or sassafras trees in Alabama, Mississippi, Texas, and Arkansas. 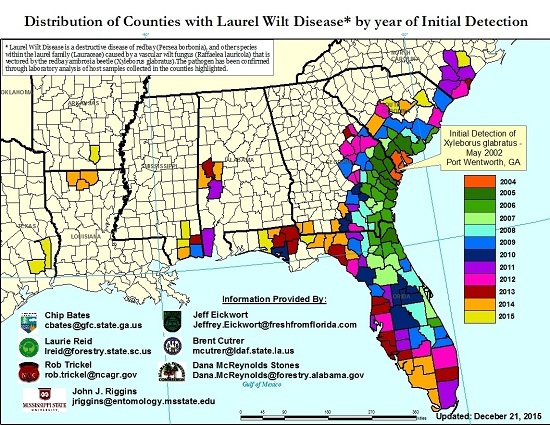 Two recent articles by U.S. Forest Service researchers and partners document the continuing spread of laurel wilt from coastal areas into the interior Southeast, where the disease is now killing sassafras trees. Sassafras, like redbay, is a member of the Lauraceae or laurel family, which includes 3000 species worldwide, most growing in temperate or tropical climates. In December 2015, Forest Service scientists Jim Hanula and Stephen Fraedrich, with Scott Cameron and Chip Bates from the Georgia Forestry Commission, published findings from long-term plots on the impact of laurel wilt disease on redbay and sassafras populations in southeast Georgia. This is the first published research that charts the entire progression of laurel wilt disease in individual stands over a variety of sites and conditions. The researchers found that larger trees in both species died at roughly the same rate, with individual trees most often dying within 6 to 8 weeks after infection, and all the large trees in a given area or plot killed within two years after disease was first detected. The partners also found that redbay stumps in the plots continued to produce below-ground sprouts that could provide replacement stems, offering a hope, albeit slim, of redbay recovery. Sassafras showed a different pattern of infection, with the disease process slowing and stopping in some sassafras stands for no apparent reason. Sassafras appears to have some degree of tolerance to laurel wilt disease, since some individual trees escape infection and many continue to produce sapwood long after infection. Though data from the study and the field suggest that sassafras will be severely impacted by the disease, researchers believe it will probably persist, at least as small trees, as the disease spreads. In a separate article also published in December, SRS research plant pathologist Fraedrich and partners from Forest Service Forest Health Protection and Iowa State University published the first report of laurel wilt and ambrosia beetles affecting sassafras in Louisiana. After sassafras trees in northern Louisiana were identified with laurel wilt in late 2014, scientists conducted surveys and found widespread evidence that the disease is spreading in sassafras in Louisiana. Original models of laurel wilt spread predicted that the disease would not reach central Louisiana until 2030, but the models did not take into account the human movement of infested wood and the apparent efficiency of the redbay ambrosia beetle to find and reproduce in sassafras. Now there’s a general concern that the beetle and laurel wilt could move into the northern range of sassafras, which is more common in states such as Missouri, Kentucky, and West Virginia than in southern states. On February 1, Forest Health Protection confirmed laurel wilt in sassafras trees in Bradley County, Arkansas. Now there’s a critical need to develop an understanding of how minor-use hardwoods such as redbay and sassafras are being used and transported within the U.S., in order to prevent the spread of the disease into the western U.S. and into Central and South America, where members of the Lauraceae are more diverse, abundant, and economically important. The next post to CompassLive will feature strategies to control the spread of laurel wilt and a recovery plan for redbay, sassafras, and other forest trees affected by laurel wilt. Read the full text of the article on research in southeastern Georgia. Read the full text of the article on the first report of laurel wilt in Louisiana. Read the news release by the Arkansas Forestry Commission on the recent confirmation of the disease. For more information, email Stephen Fraedrich at sfraedrich@fs.fed.us.